A perennial best seller since Over the Moon first opened, Kyle’s brilliantly designed salad tongs for one hand may be the most useful item in the entire shop. Made exclusively of hardwoods native to the U.S., the tongs store flat and spring open to serve salads or pastas or rolls or whatever your heart desires. 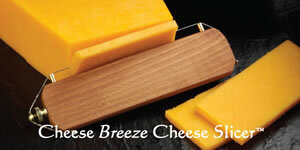 We also love his cheese slicers–the Breeze and the Ripple.